W. Bro. Ken Cownden was installed as Master by W. Bro. Ed Fehler in a unique manner. This meeting promised to be a fraternal celebration of ritual and participation and it was. The manner in which the Master Elect was installed by 15 Past masters was no less than unique. There were many guests, including a number of Grand Officers who were welcomed to the Lodge. W. Bro. Ken Birnie, PSGD, APGM presented the Lodge with a Grand Patron Certificate in recognition of the charitable donations made to the Essex Festival 2011 appeal and the Master's song was sung at the Festive Board by W. Bro. Lindsey Benson. Nearly 100 people, including the brethren, their wives and guests attended and were given an insight into the workings of the Lodge. Nearly all the brethren had a part to play and the talks were illustrated by a slide show. At the festive board the Charles Court Opera provided entertainment during coffee and a raffle was held for six marvellous cakes. A number of Brethren from St Laurence Lodge attended a meeting of the Provincial Grand Lodge . An evening with good company, fine wine and …… pies?? The traditional St George's Day gathering in aid of the Almoner's Fund was early this year to avoid Easter. Brethren and a potential candidate met for a great evening, sampling wines and eating pies! at Langdon Hills Golf and Country Club. A great day, with morning coffee and bacon rolls, various competitions, dinner, presentations and over £2,000 raised for charity! 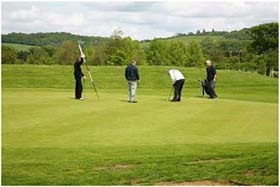 On 20th June 2011, Bro Michael Manning and two friends played 4 rounds of golf in one day to raise £7,000 for Macmillan Cancer Support. A wonderful evening with buffet food, entertainment by a Blues Brothers Tribute Band, dancing 'till late and £500 raised for charity. This time a St Laurence Ryder Cup at Burstead Golf Club. St Laurence played the Emeronians Football Club and raised over £600 for charity.